The 5th Symphony is always a good starting point I think and contains within it everything that is great about Arnold. There is a great recording on EMI conducted by the composer. Great that you mention it. I think the Fifth isn't reffered to that often among the Arnold fans here. But as it happened to be the first one I heard, somewhere around 1979 and in the EMI recording with Sir Malcolm himself conducting, I've always had a week spot for it. I vividly recall the thrill of it, especially when I discovered that I coulf find e.g. the final movement's theme "trivial", even utterly banal, and yet great at the same moment. Arnold's been one of my elementary lessons in music, later learned from Shosta and Mahler and RVW 9 as well: how `banality' may be used to great symphonic effects. I love all Arnold's symphonies, the Ninth no less than the others. But the Fifth remains a first love. I'd rank 5 as my very favorite-- it's the one that is the most structurally satisfying, and ending is haunting. Sorry, had overlooked this line, but totally agree. I like the use of the word 'lesson' there, as I certainly agree Arnold takes some degree of personal study to really appreciate. Of course I don't mean formal study, but rather patience and an open, enquiring mind. Taken at face value, the 'pop' tunes in his music can easily be taken as banal, but as you imply it is just a natural extension of what Mahler did in incorporating the 'pop' music of his time. Perhaps just because Arnold's tunes seem more contemporary we are more accutely aware of their contrast with the surrounding music, and to some ears that might grate. Certainly it took some years for me to come around to the 4th and 6th, which are almost schizophrenic the contrast being so severe. But now I love them as much as the 5th. The 3rd was my introduction to Arnold and I still think very highly of it. I discovered it at a time when I was exploring golden age film music, and I thought Arnold's 3rd quite Herrmann-esque. Of course, I later to came to realise it was actually Bernard Herrmann who was an anglophile, and who was friendly with Sir Malcolm. So perhaps we might say Herrmann's music was Arnold-esque? Yes, that's a disc I would recommend without reservation. A desert island disc for me maybe. The 5th is painfully touching under the direction of its composer, and Groves, as he did with so much music, injects an awesome intensity to the 2nd. My favorites were recently described as the music that died after the war. Tonal with bite and jagged edges! From Mahler, Sibelius, Atterberg through Saygun to Hartmann to Pettersson. Where does Arnold fit into there? I think the rest of the team did a fab job of answering your question, i.e. he fits in perfectly! Nothing more I can add, except to point you at the disc Christo posted the picture of, which has Arnold conducting his 5th in the reocrding I mentioned to you. One of the reference books that I find most useful to me is "The Pimlico Dictionary of Twentieth Century Composers" by Mark Morris. Obviously, in any such text, there are verdicts on particular composers with which I strongly disagree. Morris has little time for composers like Tubin, Hovhaness, Robert Simpson, Malcolm Williamson or George Lloyd whilst he does admire Havergal Brian and Allan Pettersson. Should a dictionary only really contain hard fact / biographical info, and not highly-subjective [and worthless ] opinions? It is-actually-an extremely valuable book in many ways. Between 2-4 pages each on composers like Brian, Daniel Jones, Rubbra, Pettersson, Rosenberg etc etc. is not bad coverage! Thank you all for your recommendations. Fortunately I can listen to the Naxos Catalogue on line for free, so I can try before I buy. However, knowing where to start is always helpful. Sounds like 5 first, then 7. "Do you think that I could have composed what I have composed, do you think that one can write a single note with life in it if one sits there and pities oneself?" Starting with No.5 would be just fine but I would query going on to No.7 next It is a dark and challenging work! Any of the first four might be better. Agreed. I'd suggest 5, 2, 3, 4, 6 then maybe have a break and listen to his delightful sets of orchestral dances to build up some positive energy before the draining experiences of 7 onwards. Sounds like a great evening in, actually. I'd agree with the 5th as a good place to start. To be honest, the first four haven't really stuck in my mind--they're enjoyable but I find they lack the emotional depth of the later works. The 7th is my unquestioned favourite of the nine, though all of the last three symphonies certainly provide tougher listening than the first six. He is one of my favourites too. And he signed an autograph for me at a concert in London to commemorate his 75th birthday . The concert included Symphony No 5 - a wonderful work. Actually I like all his symphonies (as with Bax and VW) but I think that the odd numbered ones are the best - although I increasingly like the haunting Symphony No 6.There is some great film music and I love the Concerto for Two Pianos also. Mine too, but I find them all worth hearing. The 4th comes close to the spirit of the 7th in its sheer wackiness, though. 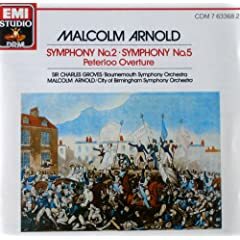 There are so many examples of Arnold's amazing facility to produce tuneful, jolly music which is also quite brilliantly scored for orchestra and/or soloists. Jeffrey has mentioned the marvellous Concerto for Two Pianos(Three Hands) but my favourites include the wonderful Dance sets-particularly the English Dances and, of course, the Scottish Dances(anyone who could write the quite gorgeous and beautiful tune in the third of the Scotish Dances can be forgiven anything ), the Overture 'Tam O'Shanter' and any or all of the concertos written with an orchestral player's understanding of the capacities of so many different instruments. One of my favorite Arnold pieces is the less known "Philharmonic Concerto" from 1976. A three movement concerto for orchestra, it was written for the London Philharmonic and Haitink to be performed on their US bicentennial tour. I heard it live back then, likely my first exposure to Arnold. A fascinating passage in the first movement for snare drum and harp stayed in my memory for years until I was able to snag a recording. As I discovered, this piece and the passage was so typical of the quirky, jagged Arnold late works. The LPO label has two recordings of it, one with Handley and one with Haitink. And, being an accomplished trumpet player, few composers can write as effectively for the orchestral trumpets as Arnold. They are as distinctive as Stravinsky's woodwinds in my opinion. One thing I like about Arnold is that he took brass seriously (he would, being a trumpeter). The 1st Brass Quintet (I haven't heard the 2nd) and especially the Symphony for Brass Instruments are superb achievements in that too-rare genre, Serious Brass Music. Just on that topic, serious brass music, do you know Philip Wilby's Revealations Symphony for double brass band? As so often, I can only utter full agreement. But let me add another personal favourite. 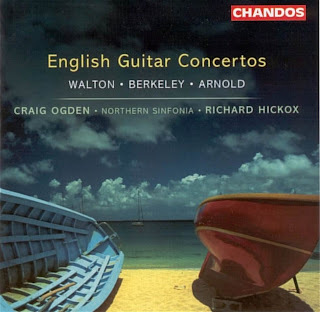 I think all of Arnold's concertos are never less than pleasant, but the one that I love most is his Guitar Concerto Op. 67 (1959). In the past, I owned an LP with Julian Bream performing it, and that version (now on cd in the Julian Bream Edition, but I don't have it) is probably still the best. in his polystylistic tendencies. I do wonder if it's in part related to the fact that both were phenomenal film composers as well as creators of concert works of great personality--but perhaps that's a topic for another thread. Interesting observation. I would locate the "polystylism" of Arnold above all in his notoriously erratic and manic-depressive personality - I think Schnittke's approach was quite different, more intellectual. One also has to factor in Arnold's appreciation for pop-music forms and his early love of jazz. In this way he is analogous to pre-modern composers who made use of the pop (or folk) music of their own time. Curiously, when I first heard Schnittke's 8th Symphony, it reminded me strongly of Arnold's 9th. For what it's worth, my pet nickname for Arnold is "the pocket Shostakovich."